If you have truck tarps with holes, rips, or tears contact us to get your tarps to our repair facilities. We offer truck tarp repair services for our tarps as well as our competitor’s. Once we have your tarps, we will evaluate the damage and get you a quote on the repair. Our superior customer service representatives will make sure that you are informed of every cost and step we take to repair your tarp. 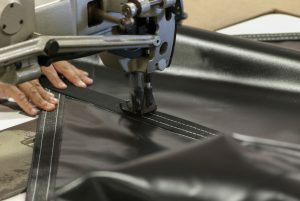 We use high-quality materials to make sure the repairs to your truck tarps last. We are experts in truck tarp repairs, so whether you have a heavy-duty truck tarp or a lightweight one, we have the expertise to repair it. From dump truck tarps to flatbed truck tarps to container tarps, we are ready and waiting to repair your tarp, so give us a call today! If the tarp is beyond repair, or the cost is more than a replacement, we will contact you before any work is done. Our goal is to get you the best result for your dollar. Contact us to setup a time to drop your tarps off or have them shipped to our office for repair.